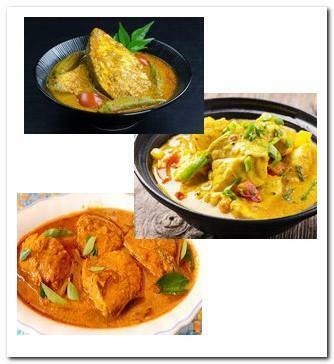 Fish curry has strong flavors and smooth gravy. Fish fillet or fish are cut into pieces, cook with spices and vegetables. Eggplant, long bean, tomato and okra always cook with fish curry in one pot. Serve it with rice, rice noodles or bread. Fish curry is a good meal with no other dishes needed. Heat oil in a wok or saucepan. Add onion, saute till soft. Add garlic, ginger and chili. Saute till fragrant. Add curry powder, turmeric powder and brown sugar, stir and saute till smell good, approximately 1 – 2 minutes. Add water and coconut milk or fresh milk, stir and bring to a simmer. Add okra, eggplant and long bean. Keep simmering for 5 minutes. Add fish, lid on. Simmer for another 10 minutes or until the fish are just cooked.